Having been on the road a good 14 months now, I haven’t had as many opportunities to support my favorite artists this year. But that’s why I came up with this whole True Fan Boost idea in the first place, isn’t it? To use Labor Day as a reminder to do just that! So even though I’m unemployed and living off savings, I’m going to make sure to give at least a little something to the people’s whose work I enjoy. Jonathan Coulton, who made headlines this year with his interview on NPR, has just released a new album — perfectly timed to coincide with my Labor Day purchase! I just picked up the $10 digital download version of Artifical Heart, but I’ve yet to listen to it (I’ll wait until I have the time to give the first listen my full attention.) JoCo’s put a lot of his music out there already, but this album is different. It’s his first studio-produced outing and also his first major album with a theme. I also see he’s got Suzanne Vega on there! I’m looking forward to this. But I’ll confess one thing. I haven’t played Portal 2 yet, so I removed one song from my playlist until I first listen to it at the end of the game. Spoilers! If you’ve been following along on our travel site, Postcard Valet, you’ve probably heard me mention a couple new friends. We met Wendy and Dusty in Ecuador, hooked up with them again in Peru, Bolivia, and Argentina, and even lived in the same building for a time in Buenos Aires. We expect to see them again in Thailand in a couple months, too. If you scroll back through my blog, you can read all you want about my thoughts on the True Fan Boost – an idea I had after reading Kevin Kelly’s 1000 True Fans article. In a nutshell, every Labor Day I make sure to give some of my money to the independent artists, programmers, and content creators whose work I enjoy and, further, to highlight their work on my blog so that others may find them, too. Back when I was a starving college student, I thought nothing of pirating the occasional song, but over the last few years, I’ve watched the business model for digital content change. You can get anything for free now… if you’re willing to set your morals aside. Music, books, movies, TV shows, comics, software… the list goes on and on. Content creators coming onto the scene today recognize this reality and build their business models around free content. Jonathan Coulton lets you listen to all his music for free. Penny Arcade and PVP Online post their web comics online for free. Lee Goldberg is converting his out-of-print books to Kindle versions. And many, many programmers are offering free versions of their software online. In each of these cases, the creators have alternative revenue sources. Coulton sells merchandise at his concerts as well as full albums on iTunes; PA and PVP sell posters and T-shirts online; Goldberg receives royalties direct from Amazon for his eBook sales; and programmers often sell more capable versions of their software or have PayPal “donate” buttons on their web pages. Here’s the thing: Their content is free for the taking. We can enjoy their work without paying a cent. But if that’s the way we want go about it (and we can — unlike out-and-out piracy, there’s no moral obligation to buy anything when artists give it away for free! ), without any financial support, our favorite artists will eventually stop making things for us. If I can help keep them going by spending some money and creating some links, I’m happy to do it. If you’ve been enjoying someone’s “free” content, even if it’s just a blog, Youtube series, or some small piece of shareware, I hope you’ll consider doing the same. This year, as I embark on a year-long backpacking trip, I won’t have any extra room for material possessions. Most of the support you see below will necessarily be for digital items. Last year on Labor Day, I posted an entry on this blog about something I called “the True Fan Boost.” The idea was to use Labor Day as a reminder to support the independent artists we love, either financially by buying some of their work or at least by sharing their work with others. I’m going to do the same again this year. If you like the idea, I invite you to do the same on your own blog, Facebook, or wherever seems most appropriate. With only a week before Labor Day, it was a long shot that my little blog post would fire up the Internet with the True Fan Boost concept. I did send out an e-mail or two, on the off chance that someone with a larger readership would push the idea. I actually got a response back from Kevin Kelly, but after rereading it a few times, I realized that I may not have been clear enough in what I was trying to accomplish. Kevin thought that I was out of synch with the 1000 True Fans concept by using Labor Day to support any and all artists (i.e., He thought I was encouraging people to go out and buy Aerosmith albums, Stephen King books, or any other products by established artists.) Not true. I want nothing more than to “boost” the sales of independent, internet-based artists with this idea. Aerosmith is out, Jonathan Coulton is in. Kevin also seems to be focused only on the TRUE true fans – the ones that will drop $100 a year on their favorite artists. What I’m trying to do is mobilize the Lesser Fans (as he calls them), in addition to the True Fans, into an economic force. This may be beyond my means. I used to carry around a Victorinox Swiss Army knife. The first one I owned was a present for my 16th birthday. Thinking back, I must have had that red-and-white knife in my pocket most every day for 13 years or so. I took it to work with me every day and it was an essential tool to take on vacations to foreign countries. Then, of course, September 11th, 2001. Being a big fan of traveling without checked luggage, I was forever forced to leave my knife at home. Sadly, after a month-long vacation at the end of 2001, I got used to an empty pocket. I still have a Swiss Army penknife on my keychain; however, I only ever seem to use it for cutting through packaging tape. I miss the utility of a bigger knife, but I’m not sure I’ll ever go back to carrying one. The spot I reserved for it, my right front pants pocket — keys on the left, wallet back right, loose change goes uncomfortably in the back left, otherwise it scratches up my phone or flies every which direction when I extract my keys — is now occupied by a cell phone. 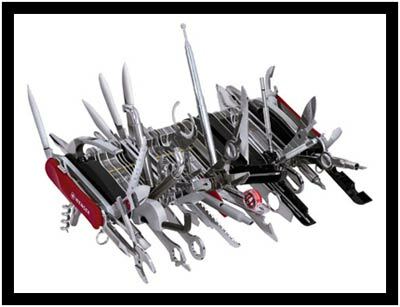 I’ll wager the biggest hazard to Swiss Army knives and Leathermans (Leathermen?) is the TSA. We’ve all heard stories of the stressed-out passengers who, after hours spent zigzagging through airport security lines, are forced to give up their expensive Swiss Army Knife, Leatherman, Zippo lighter, or any number of other “terrorist” items like, you know, a bottle of Diet Coke. Rather than allowing the TSA to auction off our personal items on eBay, there’s got to be a business model here. Set up kiosks in each airport, ideally in close proximity to the TSA screening areas. When items are inevitably confiscated, passengers would be given the opportunity to trade them in for a ticket. The ticket will record what item was left behind, and will be redeemable for an equivalent item, at a similar kiosk, in the airport of their destination. I’m thinking this would work a lot like the DVD rental stores that have been popping up in airports. Rent a portable DVD player and a couple movies in Sea-Tac, return them to a different store on the way to the baggage claim at LAX. Unfortunately, there would be no guarantee that the kiosk at your destination would have the same model of pocket knife for exchange. In that case, the enterprising business could opt to let you select an item of equivalent value, or let you keep your ticket until you return home. If all the kiosks’ inventory were tracked by computer, it should be easy enough to notify the “home airport” to hang on to the passenger’s original item until their return. In fact, that could be another whole aspect to the business. Instead of an exchange (which would only really be advantageous to the passenger that simply must have a pocket knife or lighter while traveling), the kiosk could simply be a storage area for those passengers that forgot to leave behind or check their “dangerous” items. It could operate like a pawn shop, holding the item for a set amount of time before ultimately gaining the right to sell unclaimed items for a profit. An idea like this would initially only work in the major airports, but over time, if inventory is collected and redistributed intelligently, I could see it expanding to out-of-the-way places like Juneau International. Of course, to make it profitable, the business would probably have to charge for the service, but I’d much rather pay a small fee than surrender a 13-year-old birthday present to the TSA simply because I was running late for my flight. Recently I read about some bloggers who had been devastated by the loss of their writings. It sounds like this wasn’t just a coincidence, but rather a global problem with the service they were using, Blogger. Doesn’t matter; I run my blog with WordPress. But it did get me thinking. Once upon a time, I installed a word count plug-in on my blog. It’s right up there at the top of this page. As I write this, the total is up around 168,000 words. That’s a hell of a lot of information to lose. You know what would be cool? Getting a copy of my blog printed as a book with one of those online vanity presses. I’m under no illusions that it would be of interest to anyone but myself, but you have to admit that it’d be a pretty neat-o way to archive all I’ve written. I’m psyching myself up to tackle this daunting project. Lulu.com has a very robust offering of printing methods; I’ll probably use them. And while I’m confident that, in time, I can figure out their processes, I’m not looking forward to formatting 168,000 words and photos to their precise requirements. Someone should create plug-ins for the major blog services (WordPress, Movable Type, Blogger, etc.) that automatically download the entire contents of a blog and saves that information in pre-defined, ready-for-the-press, .pdf templates. Templates ready-made for specific-size book formats on a site like Lulu.com would be perfect. 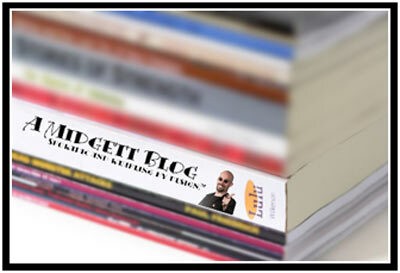 Wouldn’t it be cool to order a book version of your blog with just a click or two?